One of the most simplest vegetable, yet the least understood vegetarian ingredients of the world. A vegetable rich in Vitamins, minerals and a good source of Calcium, it is used widely in Indian Cuisine. 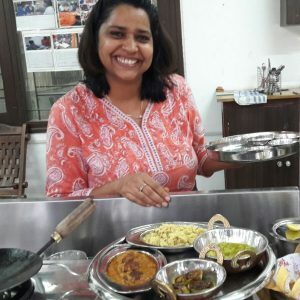 There are at least 20 different documented recipes I could find in India. It is versatile, takes surprising textures, adaptable to most palates, can be boiled, fried, sauteed, or grilled. It can act as a Flavoring ingredient like in Chettinad Style Sambar too. The only texture which, Indians don’t like for Okra is sticky and gluey. It puts us off honestly. If you find a gluey bhindi in your Thali, it is considered as a flaw on part of the Chef. And we definitely know the trick for not turning it GLUEY!! ALWAYS PAT DRY THE OKRA BEFORE CUTTING IT, HANDLE IT WITH DRY HANDS AND DRY KNIFE ONLY. Yes that’s it, just these golden words will yield you always a beautiful Okra Dish. Cut the crown and tail of the Okra. and then cut lengthwise. Heat a 1/2 tbsp of oil in a pan and stir fry on a high heat to give crispiness. Once done, take if off in a plate. Add chopped onions and ginger garlic paste. Once it is golden, add tomatoes and all powdered spices. Serve with Daal or Chana Daal Tadka – Bengal Gram lentils or Yellow Daal Tadka and Roti.